Rumor has it Chandler Riggs (who plays Carl Grimes) is about to leave The Walking Dead. Is it true? That’s hard to say at this point. There is evidence for his exit, and there is evidence against it. 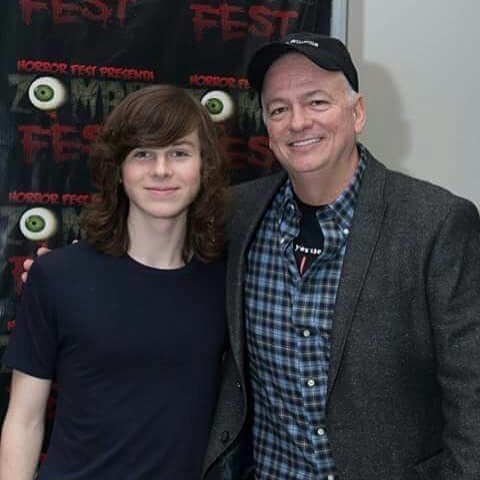 The biggest piece of evidence was briefly posted to Facebook and captured by comicbook.com before it was taken down: a letter from Chandler’s father congratulating him on a “completed 7-year contract.” They are only half-done filming this season, and for Carl to have finished by this point means only one thing. 7 year contract completed! Grateful to AMC, Cast & Crew, TWD fan base, and especially Chandler for always being 100% dedicated. Whether is was getting up at 4 AM, working in the freezing cold past 2 AM, leaving his friends and carefree kiddom behind, scrambling to make up missed schoolwork, he has done it without complaint and always made me proud & amazed to be his dad! Why would Riggs leave now? Because he’s going to college. One of Chandler’s tweets from earlier in the month says “ayy i just got accepted into auburn,” aka Auburn University. If he’s about to quit, his reason checks out. Then there’s Carl’s current storyline, where he’s about to sneak into Negan’s compound for what we’re being led to believe is an assassination attempt….from a guy with no depth perception who can’t throw a dart correctly. However, there are reasons the series might not want to kill Carl off, the biggest reason being they just killed two people and this death wouldn’t leave much of an impact. It would feel like overkill and critics everywhere would shout that the shark has jumped. Also, while Riggs is indeed headed to college, that doesn’t mean he HAS to leave the show. Auburn University is within driving distance of the Walking Dead set in Georgia. He could still plausibly stay. Even if Chandler is spending all his time at college now, it doesn’t MEAN Carl Grimes has to die. Negan could simply capture him the way he captured Daryl, and then we just wouldn’t see Carl for a while. What would you prefer?